Brief Synopsis – The story of internet activist Aaron Swartz and the circumstances that led to his untimely death at the very young age of 26. My Take on it – I am not the biggest fan or advocate of documentaries, but whenever I choose to watch one, I quite often enjoy them. I want to thank Mark Hobin of Fast Film Reviews for suggesting that I watch this movie because it was really eye-opening. I think that every documentary can be classified into 2 categories; ones that tell a story that already happened usually having some kind of one sided agenda and only briefly shows the second side, and when a documentarian follows a story as it happens and doesn’t know what will happen at the end giving us a more objective view of events. This movie fits into the former category. The film makers chose to show the history of events that led to the tragic death of internet genius Aaron Swartz. The story is almost completely one-sided, but I can obviously understand why the government side refused to cooperate with the film makers because the way the story is presented elicits lots of anger from the viewer as to what happened. Due to my ability to generally attempt to believe what is happening in a movie is truthful in the world it is presented from, I was able to disconnect myself from the fact that this is one sided and also feel anger towards what happened without feeling manipulated too much. I personally DO believe tho that open source and copyright laws need to be amended and updated to reflect the current times. Despite the anger, I thoroughly enjoyed the way this movie was presented and if only 10% of what is spun here is true, it is still disgusting and appalling that the government acted the way that it did. 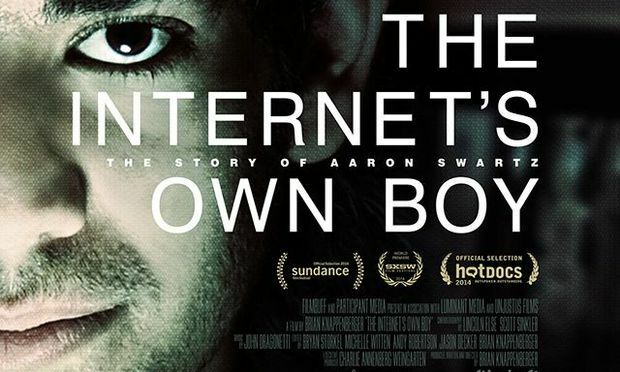 This movie hammers in the fact that it is so unfortunate that Aaron is no longer with us, because he was trying to make the world (and especially the Internet World) a better place to live in. Bottom Line – Very riveting documentary that makes the viewer feel so angry at this tragedy. Its possible that the film makers manipulate us into anger, but even if only parts of this are correct, its appalling that the government acted this way. Highly recommended! This is why I blog. I love when readers like you take a recommendation of mine and then appreciate the film as I did. Thanks for mentioning me in your review! P.S. I hope we hear more of this documentary come Oscar time.